Come to Center Street Saturday, December 8 at 1 p.m. to see this years parade. Local businesses, groups, and organizations decked in their holiday best will bring spirit and cheer with festive floats. Monetary prizes and trophies will be awarded for the first, second, and third place floats. And other awards will be given for the Most Original, Funky Folly, Best Golf Cart, Best Beach Theme, and Best Alternate Transportation themed floats. 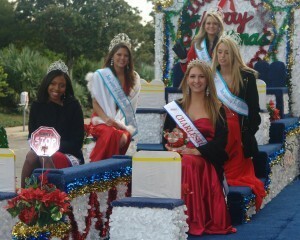 After the parade, Santa Claus and the mayor will be at Folly River Park. The mayor will hand out the parade awards, and Santa will be available to hear Christmas wishes. If youre planning on watching the parade, know that the bridge on and off the island closes at 12:45 p.m. on Saturday, so plan to get there early. And if you want to participate, you can line up on the causeway behind the Parade Lineup Here sign beginning at 11:00 a.m. If you have your eye on a trophy, then make sure to have your groups name clearly marked on the float so the judges can see it from in front of city hall. Remember, though, no Santa costumes or political signs.